Mercuria acquired Noble Group’s ethanol plant in South Bend, Indiana. As part of a restructuring, Noble divested its only ethanol plant in the U.S. Noble had originally purchased the non-operating plant in 2013. A Swiss-based commodities firm, Mercuria has no other ethanol assets in the US. 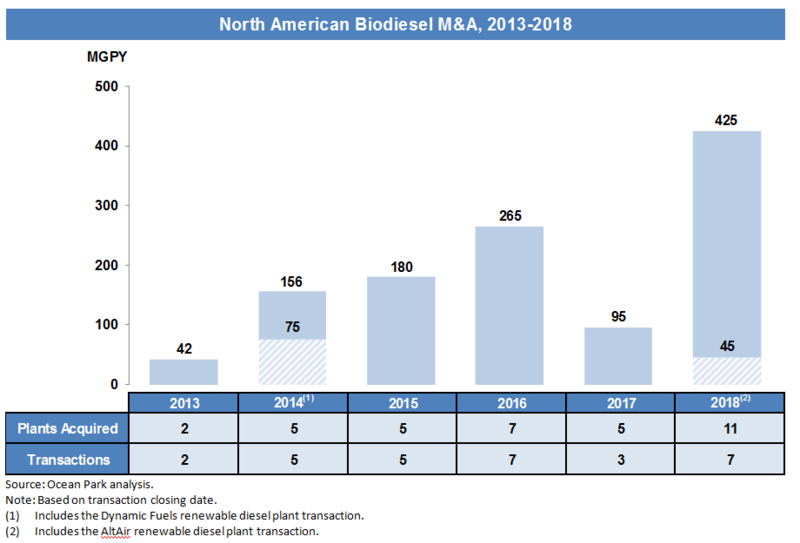 Ocean Park tracked three advanced biofuels M&A transactions during 2018. Biodiesel: For 2018, the effects of the U.S. International Trade Commission’s ruling against biodiesel imports from Argentina and Indonesia resulted in increased domestic demand and record profits. In August 2018, operating margins were as high as $0.66/gal, the highest since November 20131. As a result of this favorable operating environment, many companies now have healthy balance sheets. Ocean Park expects an active M&A environment to continue as companies look for expansion opportunities. 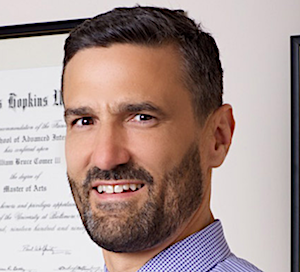 Advanced Biofuels: The permanent shuttering and subsequent sale of DuPont’s $400 million cellulosic ethanol facility highlighted the challenges for new advanced biofuels technologies. Difficult macro conditions are likely to continue throughout 2019 for advanced biofuels as a result of low oil prices and volatile public policy. Due to these increased investment risks, many financial and strategic investors may have little appetite for project financing of nascent advanced biofuels technologies. 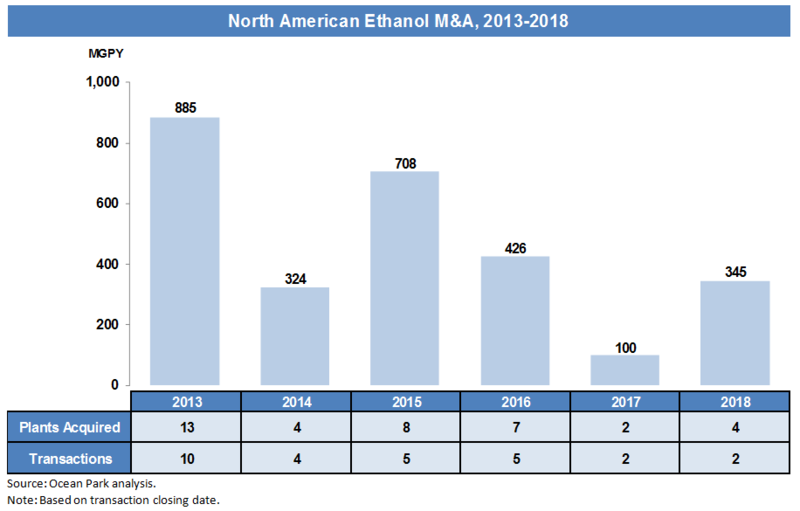 Existing advanced biofuels companies on a tight cash runway that are unable to stretch funding are likely to come under financial pressure and seek M&A as a strategic alternative.